In order to make that wedding moment perfect, bridesmaid dresses play an important role. 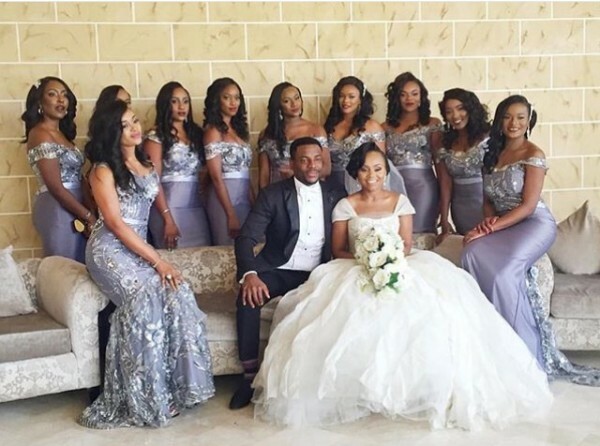 You need to plan out and coordinate beforehand how you want the bridesmaid's dresses to be as a complement to the theme and ambiance of the venue. If the theme of the wedding is shiny and glamorous, the bridesmaids should be dressed in something alluring. This can involve beautiful gowns of sequin combined with tulle. The fancy net effect of tulle adds royalty to the dress and brings out the best from it. This glamorous outfit can be paired up with simple and designer rings made up of mixed metals to give a finishing touch to the dress. For the hair, a messy stylish bun would add a grace to it. If the Royal wedding has the formal essence to it, it is necessary that the bridesmaids opt for something classic and regal such as a deep navy color. A smartly fit lacy dress or a gown with a royal navy color can be the best option that would complement the shade of the bride’s dress. Simple finger rings and a decent locket if paired with the dress would add utmost grace for sure. A smart and neat hairstyle will finish up the last needed touch to the appearance. Light and beautiful colors like silver and dusty rose bridesmaid dresses are the perfect selection for an evening with a romantic royal theme. Butterfly shaped sleeves and long skirts of the fishtail style are the leading trends that can complement your body and be a perfect bridesmaid dress. A simple and elegant bracelet is what would add more grace to your attire and definitely don’t forget to loosely pin up your hair for a perfect finish. In case you want to add colors to the wedding, flowers are the best option. Dresses with beautiful floral prints complement the floral decoration and theme of a royal wedding majestically. A smartly fit gown with beautiful and colorful flowers is what you as a bridesmaid can opt for a bohemian approach to the occasion. Simple layered bracelet or beautiful finger rings would enhance the beauty of the dress. A fancy hairstyle as per your face can make you look perfectly dressed for the big day of your sister or best friend. These are thus a few bridesmaid dress suggestions which you can follow for a Royal Wedding. They’ll complement the beauty and uniqueness of the Bride’s dress and will make the squad look outstanding.